I gotta say I really dig Smog Shoppe as a wedding venue!! Like, if I can pleaseeee book a 2011 wedding at Smog Shoppe I will be an incredibly happy camper!! It’s a super hip indoor/outdoor space. Very modern but also a little vintage. There’s something about it that’s just FUN. It’s definitely not a very traditional or elegant venue. But it is definitely a great spot for brides who want something different, modern with a hint of vintage, vibrant, chic and fun. It’s an elbows on the table kinda venue while still being classy. And that is just so my style. I really, of course, enjoyed the Enjoy Cupcakes trailer! I was lucky enough to get to work with Amber and Kevin of Enjoy and Jenni and Jamie’s wedding! There cupcakes are DELISH and their set up could not be cuter. I was recovering from my tummy flu that day so I couldn’t try all their samples (gosh darn it) but the two cuppies I did manage to have were divine! Seriously brides, run don’t walk to Enjoy Cupcakes! I also enjoyed looking at the display Lo Boheme and Untamed Petals had up. Both girls make sassy bridal hair adornments and I am in LOVE. I love love love sassy hair adornments on brides. Flowers. Birdcage veils. Feathers. Augghh. Just swoon. Another major highlight was all the different tablescapes that were set up. Each one was so unique and had such great style. Any bride would be lucky to work with any of the event stylists and floral designers that were featured. There was seriously some really lovely work. My favorite was probably by Jesi Haack (a planner/stylist that I am just dyingggg to work with) and Dandelion Ranch (amazing florals) because theirs was so very dramatic and clever. They created a hanging centerpiece and used tin cans as the vessels for all the flowers. It struck me because it was so beautiful and yet, it could probably be done on budget as the main motif was tin cans. I know money is tight right now for everyone and every bride has a budget to stick to…but brides! You don’t have to sacrifice good design and style. If you think outside the box even tin cans (which you can easily collect over the year of planning) can look so chic as wedding decor! So yeah, Jesi + Dandelion Ranch rock on with your vision! So all in all I really liked Hitched Event and I hear they will be doing round 2 soon! So 2011 brides, you should consider going! 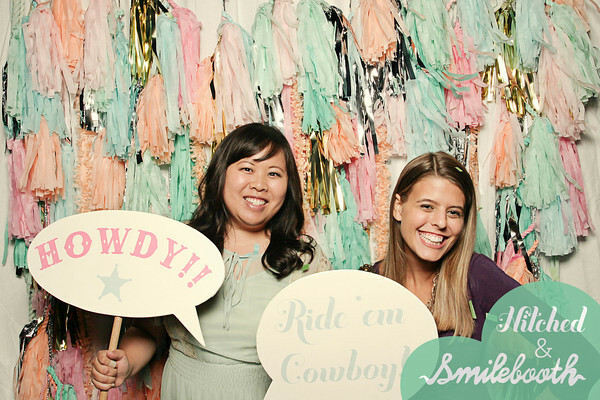 They had a lot more fun, creative ideas than your average bridal expo. And really hip vendors!! I would seriously be happy to work with ANY of the vendors showcased at Hitched. All of them are A+++ So follow Hitched’s blog and go to the next one! It’ll get your planning juices flowing!